The Chicago system on the last day of operation of the Cermak, Halsted, Kedzie, Lake and California lines. 4 Cottage Grove W Randolph St. & N Wabash Av. - Wabash Av. - Indiana Av. - Cottage Grove Av. - 115th St.
8 Halsted Grace St. & Broadway - Halsted St. - W 79th St.
22 Clark Howard St. (City limits) - Clark St. - S Wentworth Av. - Vincennes Av. - W 81st St. & S Halsted St.
36 Broadway N Clark St. - Devon Av. - Broadway - N Clark St. - N State St. - S State St. - Indiana Av. - S Michigan Av. - 119th St. - S Morgan St.
42 Halsted Downtown Lake St. - [State St.] [back: Polk St. - Dearborn St.] - State St. - Archer Av. - S Halsted St. - W 79th St.
49 Western Berwyn Av. - Western Av. - W 79th St.
1 Putting the downtown terminus of line 16 (State) at the intersection of Van Buren St. and State St. is pure guess - but it must have been somewhere! Note: The one and two-character codes used to identify routes below and in the maps are for convenience only, and were not used by the operating company. 1 State Street Subway Roosevelt Rd. - State St. - Division St. - Clybourn Av. - North Av. DP Douglas Park Line Loop - (Lake Street Line) - Marshfield - Douglas Park - 54th Av. EH Englewood - Howard Englewood - Pershing Rd. Station - Roosevelt Rd. - State Street Subway - Belmont - Howard St.
Chicago Aurora & Elgin Railroad (CA&E): ? km. Chicago North Shore and Milwaukee Railway: 165 km. Chicago South Shore & South Bend Railroad: 141 km. 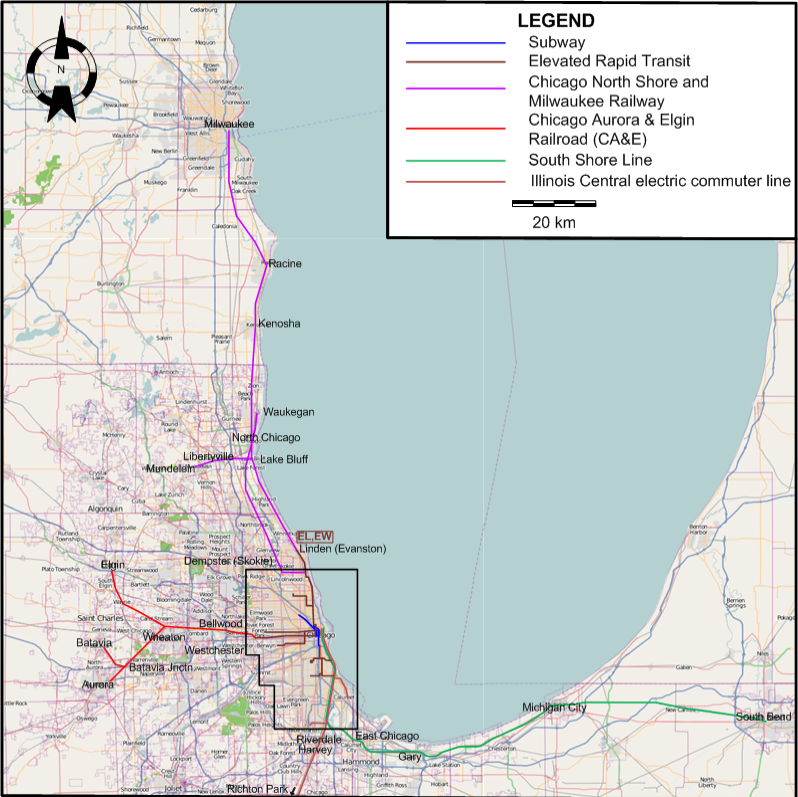 Electric commuter line (Illinois Central): 46 km. Horse-drawn streetcars: 25 Apr. 1859 - 1906. Compressed-air streetcars: 1890 - 1986. Battery streetcars: 1896 - 1 July 1901. Cable cars: 28 Jan. 1882 - 23 July 1906. 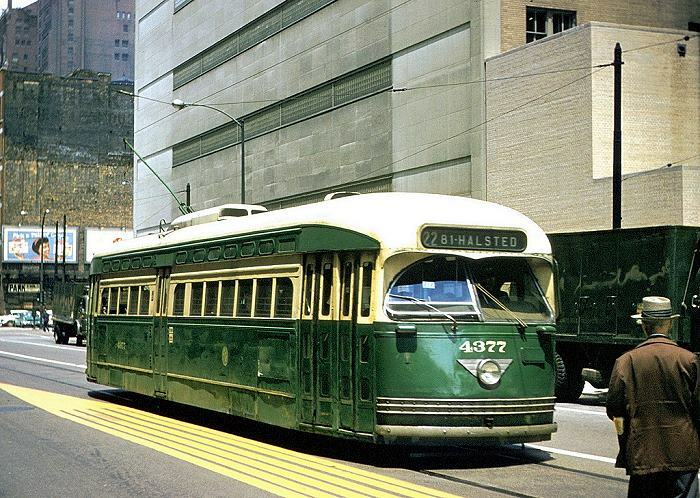 Electric streetcars: 2 Oct. 1890 - 21 June 1958. Chicago, Aurora & Elgin line: 25 Aug. 1902 - 3 July 1957. North Shore Line: 1895 - 21 Jan. 1963. South Shore Line: 1903 - today. Chicago & West Towns Railways: (horse-drawn) Feb. 1889 - 1891; (electric) 1891 - 10 Apr. 1948. Subway: 17 Oct. 1943 - today. Elevated (or "L") lines: 6 June 1892 - today. Commuter line (formerly, Illinois Central): 21 July 1856 - today (originally, steam; electrified since 1926). The Illinois Rail Museum, in Rockford, IL, about 100 km. 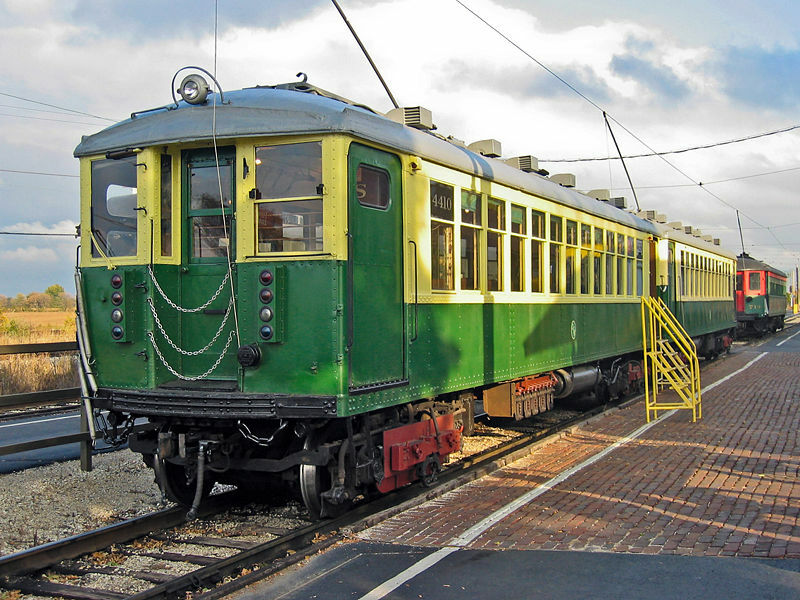 NW from Chicago, has about 10 preserved Chicago streetcars, and a large number of preserved interurban and rapid transit vehicles that used to run in the Chicago area. Many of them run regularly on the museum tracks. Buckley, J.J. Chicago & West Towns Railways. 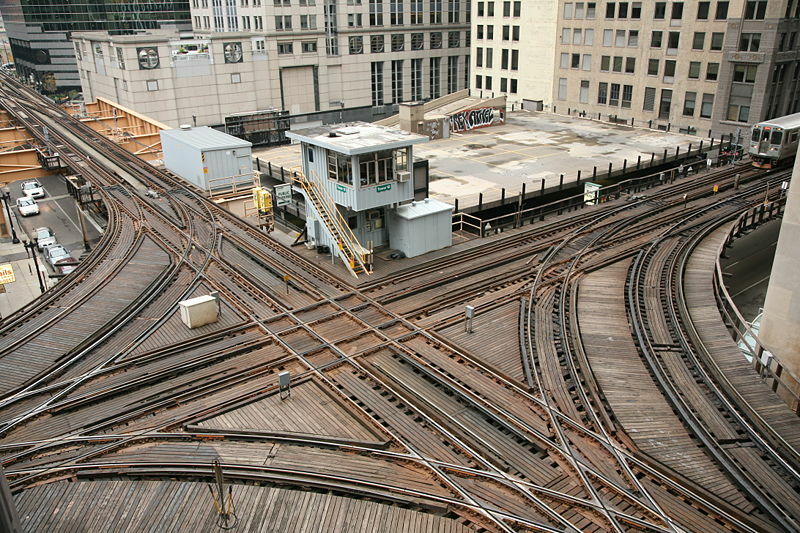 Chicago: Central Electric Railfans Association, 2006. Lind, A.R. Chicago Surface Lines - An illustrated history (3rd. ed.). Park Forest (Ill.): Transport History Press, 1979. 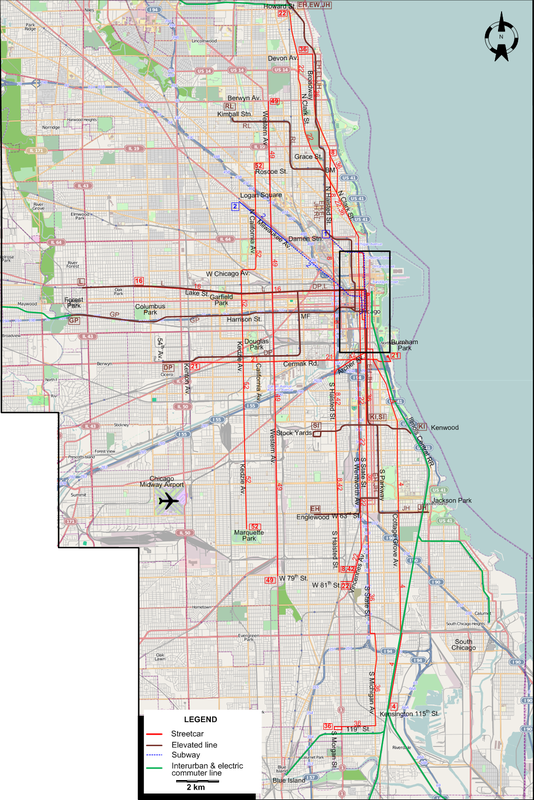 Map of Chicago Rapid Transit Lines. Chicago: Chicago Rapid Transit Company, 1946. Johnson, J.D. A century of Chicago streetcars. Wheaton (Ill.): The Traction Orange Co., 1964. Simons, V. "Chicago: Modernisation and renewal" Tramways & Urban Transit, Jan. 2014 (77: 913), p.17-21. Also, thanks to Emmert Clevenstine of Ferney-Voltaire, France, for relevant documents he has given me over the years, as well as to Russell Powers from Denver CO and Peter Zondag from the Netherlands for their kind suggestions sent over the Internet.